I missed this story until I found time to rifle through the pages of the DomPost later in the day. It's basically a brawling story with little to recommend the victim either, although the reporting is somewhat ambiguous. 8 women set upon a single woman in retaliation for an earlier incident. The attack was vicious and happened late in the evening in Stokes Valley. Acting Senior Sergeant Donna Rider said the attack was linked to an ongoing dispute but said the behaviour was "disgusting". "I'm horrified at the level of violence from these women. The other aspect to it is that two of them are pregnant and several others claim to be pregnant. "One of them is eight months pregnant ... [you] can only guess at what kind of parents they'll make." "Claiming" to be pregnant to avoid court-ordered consequences no doubt. Exploiting their babies even before they are born. My heart, and maybe yours, goes out to the innocent babies that these women will bring into the world. But it won't be going out to them for long. A few years down the track they will have grown into replicas of their mothers, in some form or fashion. And it is quite probable that they will all be raised on your money. Time to coin a new phrase. Add to state houses, state wives. Like many state houses they symbolise a seedy side of New Zealand that social policy makers seem unremittingly determined to sponsor. The following is an excerpt from an interview with Gary Becker which appeared in the Wall St Journal (distributed today by the NZ Business Roundtable). Beautifully written by a former speech writer to Ronald Reagan, it's well worth 5 minutes of your time. And it's quite uplifting to boot. "No, no. Not at all." So says Gary Becker when asked if the financial collapse, the worst recession in a quarter of a century, and the rise of an administration intent on expanding the federal government have prompted him to reconsider his commitment to free markets. ....My last question involves a little story. Not long before Milton Friedman's death in 2006, I tell Mr. Becker, I had a conversation with Friedman. He had just reviewed the growth of spending that was then taking place under the Bush administration, and he was not happy. After a pause during the Reagan years, Friedman had explained, government spending had once again begun to rise. "The challenge for my generation," Friedman had told me, "was to provide an intellectual defense of liberty." Then Friedman had looked at me. "The challenge for your generation is to keep it." The abortion rate is down for 2 years running now. The tables show that the biggest drop is among young NZ European women with a 4.1 percent reduction in the number of abortions since 2007. For Maori the drop is 4 percent. For Asian, 1.9 percent. But the Pacific total is up 3 percent. 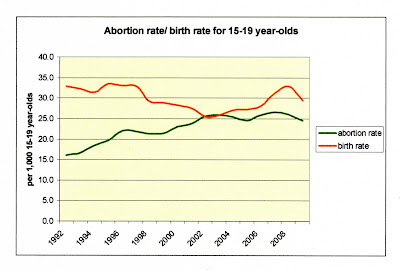 The largest drop in abortion rate is among 15-19 year-olds, followed by 20-24 year-olds. The only thing to be concluded for sure is that there are fewer abortions. Any other statement could be wrong. There are fewer unwanted pregnancies? Not necessarily. A pregnancy can be unwanted but the mother nevertheless decides against abortion. 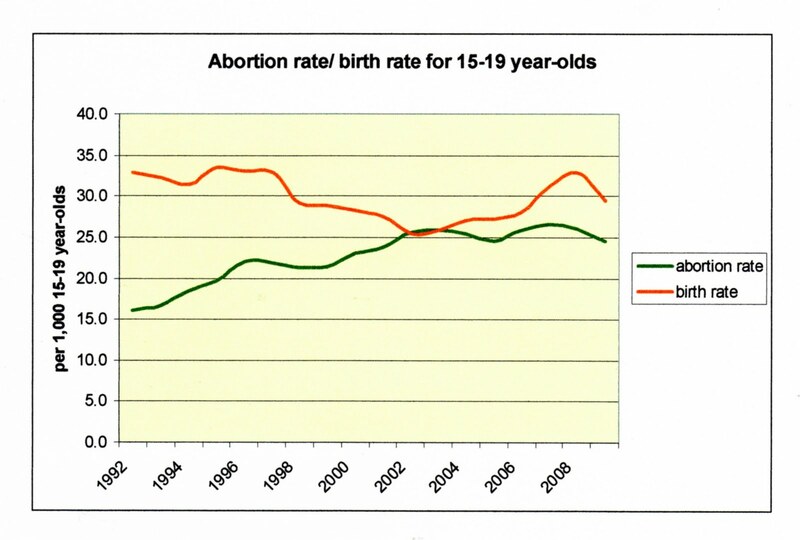 Further, there isn't any evident strong correlation between the abortion rate and the birth rate for 15-19 year-olds (where the abortion rate has dropped the most). Graphing the information shows that loosely speaking, more young women were having abortions and not giving birth until the lines converge and now more are giving birth and the same and most recently, fewer, are having abortions. During my last exhibition I noticed a young man taking notes about one of my paintings so approached him. He was very animated because he had made a connection with the painting. We got talking and he told me he was travelling the world and interested in the varying characteristics of the facial traits of different ethnicities. At his request I agreed to paint a version of any photo he wished to send me. He seemed keen to develop some sort of collaborative project. Being Spanish his English was fairly good. Much better than my Spanish anyway :-) He duly emailed me a photograph taken somewhere in South America and this is the result. Cactus blogs about the "weird" Mayor of Manukau, Len Brown, this morning. His histrionics of yesterday provoked a similar wave of amusement, distaste and finally, disdain in me. Len Brown is described as an emotional man. We are all emotional. Some learn how to control it. Maybe over-control it. Unfortunately the under-controllers are a growing force. Watching Fair Go last night I found myself cringing, God, he's no going to cry is he, about a man whose cladding had gone wrong. Increasingly we are subjected to dripping apologies. Never has Shane Jones appeared on the list of people I respect, but at least he had the fortitude to resist a sobbing self-flagellation. The it's-ok-for-a-man-cry movement can pat itself on the back. While it might want far more wet stuff yet the general direction males are going in is right on target. Well, it doesn't impress me. Browns performance was sodden with self-indulgence. But we should thank him for reminding us what self-indulgence looks like. So we can all try and avoid it. Of course my daughter will remind me that I cried during Hotel For Dogs, at the movies no less! Well that's right. But at least I had the good grace to slink down in my seat and feel embarrassed about it. Most days I check out the Times-on-line. Today I found a redesigned site. Looks better, I think, more traditional and less magaziny. But tai ho. I click on a headline that interests me and I get a message telling me to register for a 'free' trial. Bugger off. A/ I am interested but not that interested and B/ I don't have the time. I don't know what the future of newspapers is, but it isn't through on-line subscription. However, the vast majority treat welfare as a last resort. First I ask myself, what constitutes a vast majority. Over 90 percent? A small majority would be between 50 and 60 perhaps. A large majority, say 70 odd. But vast is a lot, isn't it? Something is clearly wrong when 324,814 working-age people – 12 per cent of the total – were on a main benefit on March 30 this year. Indeed. But if my 'vast majority' prescription is applied, 292,332 people are using welfare as a last resort. in 10 working age New Zealanders were receiving a benefit. Professor Bob Gregory made an observation about welfare reform at the WWG forum. That if eligibility is tightened some people will just disappear. Because they don't need to be there anyway. After the US AFDC was replaced with TANF (open-ended entitlement transformed into temporary and conditional assistance) in 1996, the number of families relying on it dropped from 5 to 2 million (or thereabouts). Some of the reasons were that people didn't believe they would meet the new criteria. Or they didn't want to comply with the work or activity requirements. Or people simply stopped going on to it. Possibly because they were saving up their 5 year allotment for when they really needed it. When it truly was a 'last resort'. Engine failures are rare. Most aerodromes are near built-up areas for public convenience. What on earth was this about? The number of New Zealanders receiving a benefit increased slightly over the month of May by 0.6 percent, but overall numbers remain below forecast. "With seasonal work winding up, we expected to see a slight increase in Unemployment Benefit figures, but it is much lower and has occurred later than it did last year," says Social Development Minister Paula Bennett. 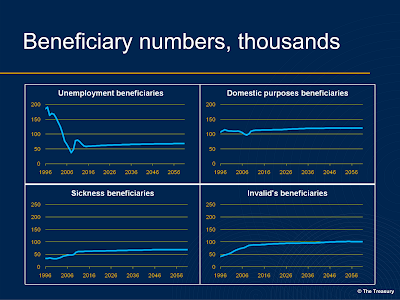 All benefit types have increased by 1,887 in total. 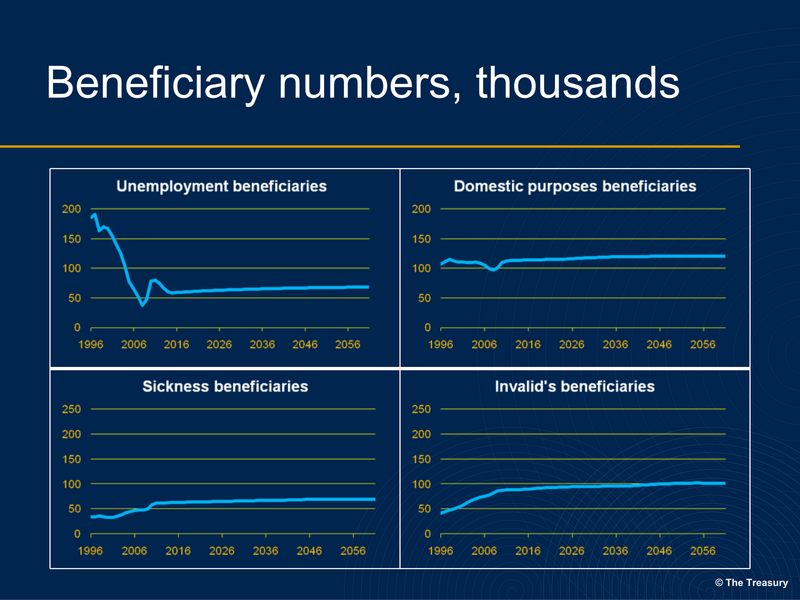 An extra 729 people have gone onto a Sickness Benefit, 342 more people on the DPB and 391 more on an Unemployment Benefit. Of course, in the past the lines have been far from flat, and will be in the future. I had been looking at this photo from a Californian prison for a while before realising that the beds are bunks. The accompanying article is about the prospect of the Supreme Court intervening in a 3 federal judge ruling that the state must release 40,000 prisoners to relieve over-crowding. "I don't get out of that bed," said Fernandez, 47, gesturing to the top of a three-tiered bunk in the malodorous heart of a human warehouse. "In a cell, you only have your cellie to deal with. But here, you got 200 different attitudes. Some guy gets a bad letter from his wife and he's going to be a problem for everyone around him." Mule Creek was designed to house 1,700 prisoners when it opened in 1987. 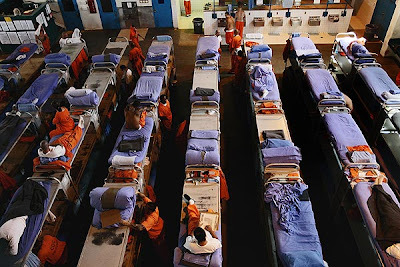 Today it holds 3,900, with two to a cell and 500 crammed into what used to be common areas for recreation. That is typical of all the state's prisons, which hold twice the number of inmates for which they were designed. It looks bad, very bad. But so does this. Have a look. 302 homicides this year in the LA county mapped. Look at the victims faces. The violent crime rate is trending down in the US. Unlike NZ. Why isn't a loan an acceptable option for people who want a gastric bypass? If the state can only afford to fund 5 to 7 in 500, it would be fairer to offer interest free loans. The operations cost between $17,000 and $35,000. Students take out loans that size. People buy similarly priced cars on time payment; take out mortgages 10 times that amount. Assuming a morbidly obese person will have a much greater chance of earning an income if they can get back to a normal weight, why don't they make the investment in themselves? Aided and abetted by MPs, why does the argument always revert to a demand that the state pay? It doesn't help or advance their cause. ACC and the insurance industry. work in the social services sector. to drive real change in the benefit system. • We need your help to do this. • So, why is this important? • Put simply, the New Zealand benefit system affects all of us. 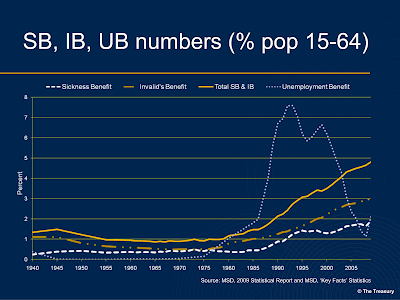 working age New Zealanders were receiving a main benefit. tax credits) accounts for 11.5% of core government expenditure. 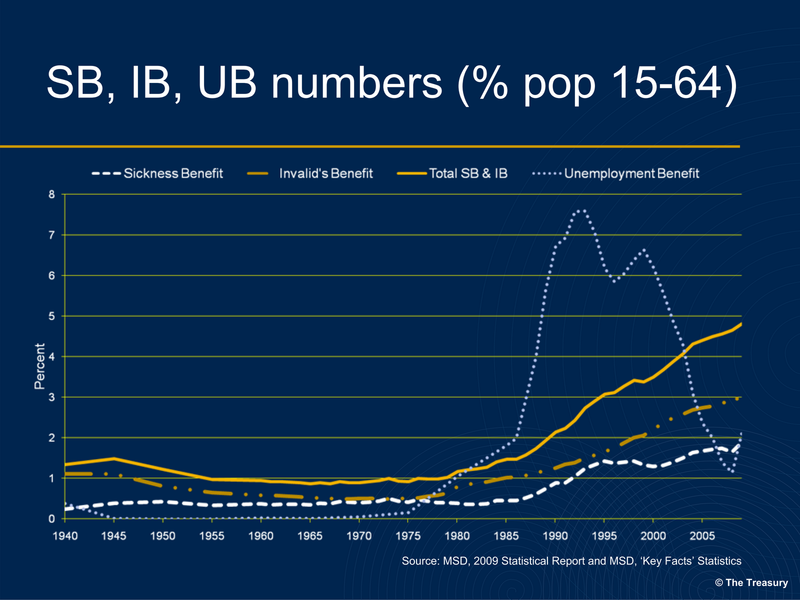 underlying trends, rather than just the recent recession. benefit? And why are some people on a benefit for so long? learn from the evidence and experience of other countries. unemployment, or they get sick or lose a partner. safety net has become a trap. around those receiving benefits for long periods of time. spent seven or more years on a benefit since 1993.
periods of time should be deeply concerning to everyone. or less continuously are actually able and willing to work. can’t do, instead of what they can do. New Zealand in 2010 and beyond. • The old approach emphasised the ‘security’ of a modest benefit. prospects that participation in the workforce offers. areas, in order to reduce these future costs. contribute to the process in a constructive way. • We need to confront some complex and difficult questions. family environment is vital in nurturing hope and aspirations. benefit. Is this an outcome we want ? should be asking of our education system? need to be put in place? address the problem of long-term welfare in New Zealand. days. Every one of you here has an important role to play. and be open to testing the boundaries.